Rainbow carrots are a healthy, versatile food. 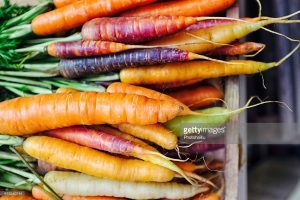 Rainbow carrots are vibrant, full of nutrients, and an excellent food for adding a pop of color to your Fall dishes. Here are some healthy recipes that can help you add some Fall flavor. Drain and dry tofu, then mix one tablespoon each of soy sauce, rice wine, and stock in a small bowl. In another bowl, mix salt and sugar, and in a third bowl dissolve cornstarch into two tablespoons of stock or water. Heat a skillet, add a tablespoon of oil, and then place the tofu into the pan until it is lightly fried. Next, add the soy sauce and continue frying until there is no liquid left. Then, remove the tofu and plate it. Afterward, put the remaining oil in the pan, add the ginger and garlic and stir-fry for a maximum of ten seconds. Place carrots, onions, and scallions into the pan and stir-fry for about a minute. Then add salt, pepper, and sugar and stir-fry until the vegetables are crisp. Add the tofu and sesame seeds to the pan and stir-fry. Serve over rice or noodles. Grease a baking sheet and preheat your oven to 425 degrees F. Cut rainbow carrots into ¼ inch-thick strips. Put carrots into a bowl, add cornstarch and toss them with your hands until they are evenly coated. Add oregano, thyme, black pepper, onion powder, garlic powder, paprika, and cayenne pepper to the carrots, then sprinkle olive oil on them. Bake in the oven for 15 minutes, flip the carrots, then cook for 10-15 more minutes. Using a vegetable peeler, cut your rainbow carrots into shavings that are about 2 inches long. Then, mix lemon juice, olive oil, white rice vinegar, and cumin together in a bowl. Pour the mixture over the carrots and toss with a rubber spatula. Afterward, season the carrots with salt and pepper and add green onions. You can find our fresh, non-GMO, sustainable rainbow carrots in national grocery store chains, produce distribution companies, roadside farm stands, local farm-to-table restaurants, CSAs, and farmers’ markets. To learn more about ordering our fresh local produce, click here. This entry was posted on Thursday, October 4th, 2018 at 10:13 am. Both comments and pings are currently closed.